The Championship title won’t be decided in the matches between Hibs and Rangers but, in games like this, the three points on offer are just as important as those at stake in the head-to-heads between the clubs seen as the greatest rivals for that coveted top spot. While Hearts ran away with things last season, this time round it’s expected to be much tighter and yet, with just one round of fixtures gone, Alan Stubbs’ side find themselves trailing a rejuvenated Ibrox club by three points. It is, of course, as Stubbs pointed out, just one game, dismissing the recollection of how a slow start 12 months ago hampered Hibs’ chances but the Easter Road head coach will be hoping this result acts as a wake-up call for his players. “There were too many who were not at it,” was Stubbs’ candid assessment, underlining the need for each player to be on top of his game every time given the slender margins which so often exist between winning and losing. And what many will see as a surprise win for the part-timers of Dumbarton must be taken as a warning that danger lies within every fixture – a glance at the unexpected points dropped throughout the course of last season evidence enough. However, as Dominique Malonga observed, better it happens now, the striker admitting events on the opening day of the season left lessons to be learnt, saying: “If we want to win the Championship we need to be focused. As far as Stubbs is concerned, there will be plenty to work on at East Mains in the coming days, the Hibs boss citing decision making, taking greater care with the first touch, minds not being made up quickly enough, a lack of sharpness and a general sloppiness as lying behind the defeat. No doubt he’ll also be highlighting the need to avoid giving away unnecessary free-kicks around the penalty area, ill-judged challenges from Liam Fontaine and Marvin Bartley offering Dumbarton two opportunities they gratefully accepted, defender Gregor Buchanan getting on the end of Willie Gibson’s low cross and the midfielder himself then dispatching a wonderfully-struck free-kick into the top corner of Mark Oxley’s net. Gibson’s strike left Oxley rooted to the spot but, in the estimation of his opposite number Mark Brown, there was little or nothing he could do about it, revealing he’d urged his team-mates to use the windy conditions by shooting whenever they could. Despite going behind for a second time, Hibs had more than half an hour to get themselves back into the game as they had done when Malonga latched onto Fontaine’s wind-assisted clearance to control the ball on his chest and lash it behind Brown. The Dumbarton goalie then stopped a shot from Scott Martin with his feet before doing well to get to a Scott Allan shot, enjoying a slice of luck as the ball then broke off the inrushing Jason Cummings before going wide. But Dumbarton, who themselves had hit the post through Garry Fleming, who also forced a point-blank save from Oxley, ensured they weren’t going to relinquish the lead again despite Hibs enjoying plenty of possession. 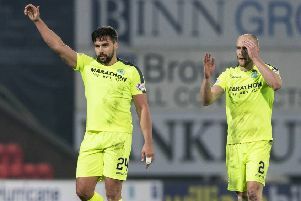 Brown, who expressed his surprise at not being tested more often as Hibs went seeking a killer final ball rather than chancing their arm with a shot, said: “You could sense not an anxiety but a frustration. “We had a lead to protect. We made it hard for them, got bodies behind the ball, which made it difficult for them to break us down. It was a familiar scenario, one which Hibs found themselves in on numerous occasions last season and, despite boasting the Championship’s top scorer in Cummings and Malonga who chipped in with a creditable 16 goals, they can, at times, look as if they lack a cutting edge. Stubbs admitted as much, saying: “The first goal was a poor goal to concede but we got ourselves back into the game and then we got ourselves into good areas, but the final ball let us down so many times. We seem to have a habit of finding their defenders rather than our attackers. And Stubbs left his players well aware of his annoyance, retorting when it was put to him that the 770 fans who had made the journey were not happy: “They are as unhappy as me. It was not the ideal start. Far from it. We wanted a more positive result but the players are under no illusions as to what I expect from what I told them after the game.” Naturally, all eyes were on Scott Allan, the midfielder starting his first game of the season as the speculation regarding his future and a move to Rangers refuses to go away despite Hibs having clearly stated their prize asset won’t be going to Ibrox. There would be little solace for Stubbs in Dumbarton manager Stephen Aitken’s assertion that Hibs will finish in the top two, the new man in charge of the Sons obviously happy with a perhaps unexpected win.